Uh, no parking after 5, please. Life deals ironic hands to all players. Timing is everything. 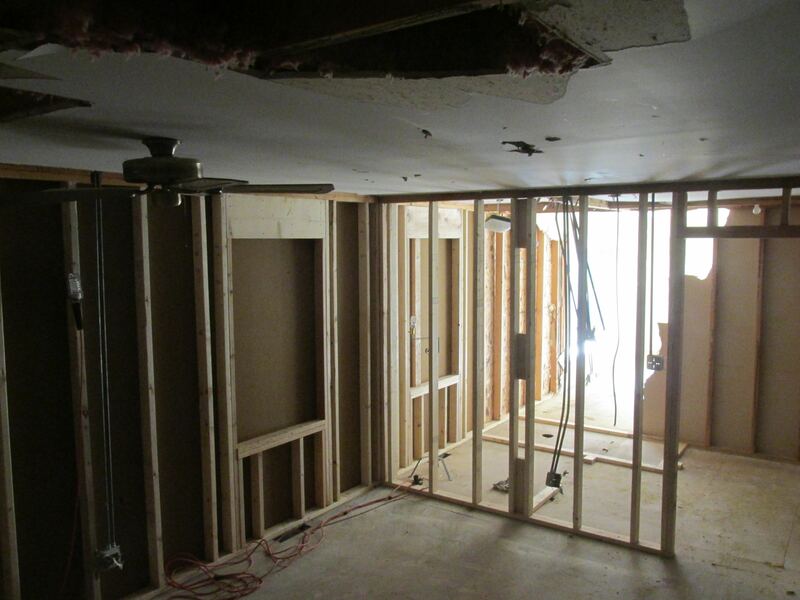 Last week, a fast moving car barged through the corner of our house leveling three rooms. Radiator coolant ended up on our coffee table. 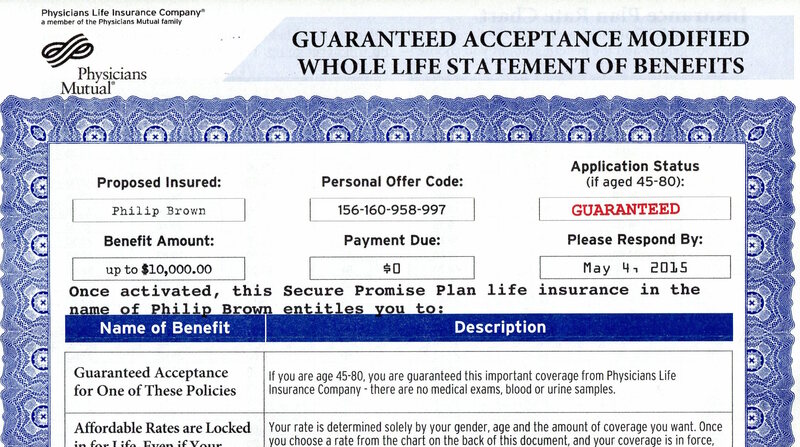 This week, we received a mailed life insurance offer from Physicians Life Insurance Company. Regardless of circumstances, this envelope would get opened, and here’s why. “Please Keep It In A Safe Place” is an arresting instruction. 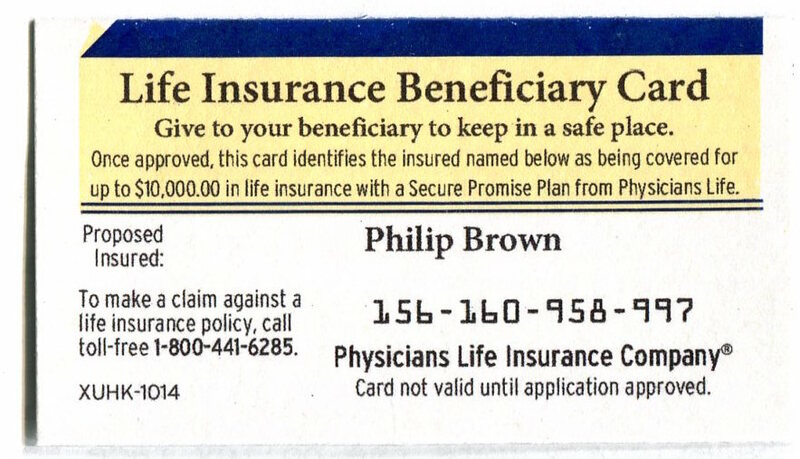 Your Beneficiary Card is Enclosed. Please Keep It In A Safe Place. The #11 envelope starts with the cautionary instruction above, and has a tiny die-cut window revealing a scannable OCR-A number, the inferred key to wealth for my beneficiaries. It takes an iron-hard constitution not to open the envelope to see what is inside. And true to their word, Physicians has attached a varnished card to the letter enclosed. The card is a token, and as promised on the envelope, to be saved. Note the 800-number. The bold, 16-pt. font is positively encouraging. Congratulating us as Illinois residents, aged 45-80, which suits my wife and I respectively to a tee in her opinion, that we are guaranteed a Secure Promise Plan. They prompt us to ask our beneficiary to keep the card in a safe place. (But in your case Mr. Brown, not in the back of the house.) It didn’t actually say that, but the suggestion is uncontrollable. The headlines: we are eligible for a guaranteed policy. Details to follow. These are powerful words, usually reserved for protecting wills, social security cards, PINs, firearms and Pokemon. The following letter reverts to 12-pt courier, fixed space font, as if it came off the very typewriter we keep next to the rotary phone on our vestibule in the front parlor. Straight forward benefit headlines. Orderly, easy to read. It is only moments later that my suspicions are confirmed that we don’t actually have a policy yet, but if we just apply by May 4th, we are golden. Courier font: back to the 60’s! But it works. 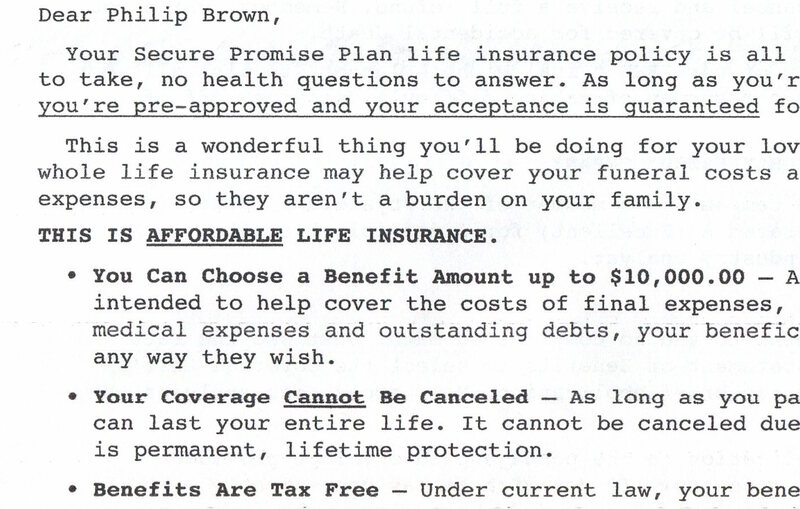 Physicians wrote perfect copy, presented by a hard working envelope. Most important, the enclosures pay off the reader’s expectations, and have shifted into second gear with an orderly sales presentation. Everything is according to the rules, and you can bet the Physicians legal crew spent hours in the office before retreating to the golf club lounge vetting the whole kit, extending their discussion out to the first tee about the careful use of commas. Policy details on varnished filigreed paper. Impressive, but not pretentious. From the prospect’s point of view, life insurance is not an impulse decision for most people. Still, for those who might be teetering on the edge, like us and the lucky folks in the car, the Physician’s package gives pause to consider. And the sale is entirely dependent upon the envelope getting opened, which this piece accomplishes. Radio, TV and web don’t hold a candle to direct mail when it comes to delivering all of the decision-making tools…on workable, readable, paper. The deal, the sales support, the application, and prepaid reply envelope, complete with return address are presented for thoughtful consideration. But it’s the envelope which kicks it off. Let’s put the parking meter by the commode. Meanwhile, we are rebuilding our house! 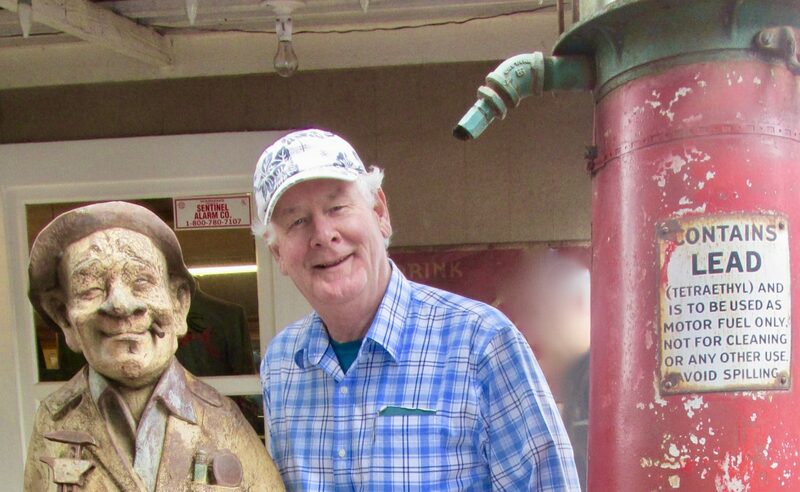 Good morning Phil, I heard about this– so glad to hear that everyone on your end is okay. Have a great weekend and keep the great ideas coming! Hi Bob! Everyone is fine, thanks. Just kind of put on hold for a few months while we re-right the ship. Phil— That picture really is your house?? Anyone home—anyone hurt? Hi Grady! yep, that is our house. 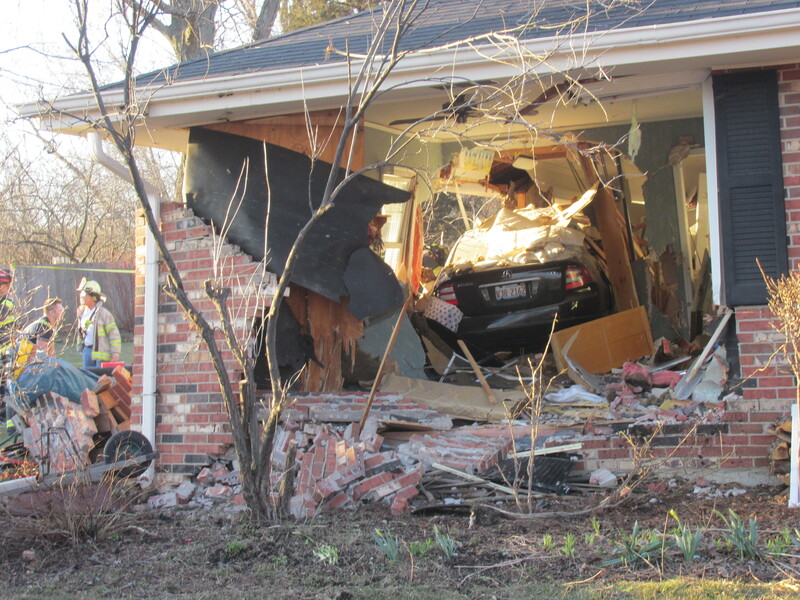 No critical injuries in the car, and we were only dusted inside, though the damage to the back of the house was catastrophic. I always enjoy your letters but a picture of your house with a hole in it is TOO MUCH!! We are very glad no one was injured. Hope you and Susan are doing well and will have fun picking out new colors to paint the walls. Hi Bob! jane and I are fine, if somewhat displaced. State Farm has been the best new “good neighbor” they always promised to be. We are rebuilding right now. Windows ordered, rooms framed and power and water are on. Just went through about 400# of brand new cleaned and pressed laundry from the restoration folks. It is 70’F here today. The fairways are full. Best to you and Sandy!